This tutorial is the tenth in a series of 12 that teach you how to build MVC 5 applications using Entity Framework for data access and Visual Basic. In earlier tutorials you learned how to update data. This tutorial shows how to handle conflicts when multiple users update the same entity at the same time. You'll change the web pages that work with the Department entity so that they handle concurrency errors. The original tutorial series, produced by Tom Dykstra and Rick Anderson ( @RickAndMSFT ) was written using the C# language. My versions keep as close to the originals as possible, changing only the coding language. The narrative text is largely unchanged from the original and is used with permission from Microsoft. This tutorial series teaches you how to create ASP.NET MVC 5 applications using the Entity Framework 6 and Visual Studio 2013 Express for Web. This series uses the Code First workflow. For information about how to choose between Code First, Database First, and Model First, see Entity Framework Development Workflows. The tutorial series comprises 12 sections in total. They are intended to be followed sequentially as each section builds on the knowledge imparted in the previous sections. Progress through the sections is reflected in a Visual Studio Express for Web project download that accompanies each section which features the web application that you build through the series. The code for this section is available here. Save the .zip file to a convenient location and then extract the contents. Make sure you have an edition of Visual Studio 2013 installed (Express for Web, Professional, Premium or Ultimate) and double click the .sln file. Once the project is opened in your IDE, press Shift+Ctrl+B to build the solution. This will ensure that all packages are restored from Nuget and may take a while depending on your Internet connection speed. A concurrency conflict occurs when one user displays an entity's data in order to edit it, and then another user updates the same entity's data before the first user's change is written to the database. If you don't enable the detection of such conflicts, whoever updates the database last overwrites the other user's changes. In many applications, this risk is acceptable: if there are few users, or few updates, or if isn't really critical if some changes are overwritten, the cost of programming for concurrency might outweigh the benefit. In that case, you don't have to configure the application to handle concurrency conflicts. If your application does need to prevent accidental data loss in concurrency scenarios, one way to do that is to use database locks. This is called pessimistic concurrency. For example, before you read a row from a database, you request a lock for read-only or for update access. If you lock a row for update access, no other users are allowed to lock the row either for read-only or update access, because they would get a copy of data that's in the process of being changed. If you lock a row for read-only access, others can also lock it for read-only access but not for update. Managing locks has disadvantages. It can be complex to program. It requires significant database management resources, and it can cause performance problems as the number of users of an application increases. For these reasons, not all database management systems support pessimistic concurrency. The Entity Framework provides no built-in support for it, and this tutorial doesn't show you how to implement it. The alternative to pessimistic concurrency is optimistic concurrency. Optimistic concurrency means allowing concurrency conflicts to happen, and then reacting appropriately if they do. 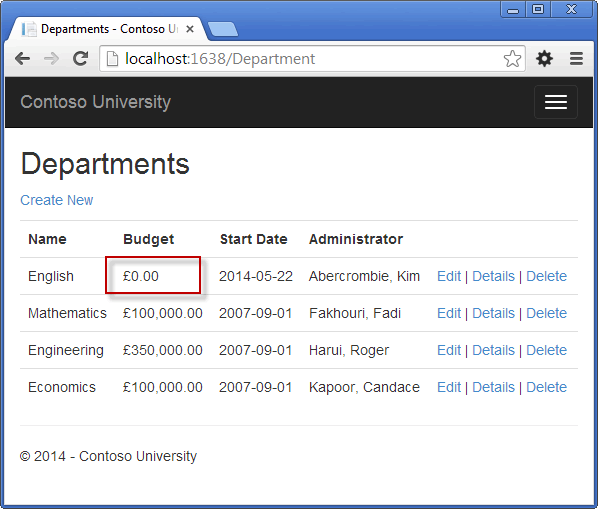 For example, John runs the Departments Edit page, changes the Budget amount for the English department from £350,000.00 to £0.00. Before John clicks Save, Jane runs the same page and changes the Start Date field from 2007-09-01 to 2014-06-07. You can keep track of which property a user has modified and update only the corresponding columns in the database. In the example scenario, no data would be lost, because different properties were updated by the two users. The next time someone browses the English department, they'll see both John's and Jane's changes — a start date of 2014-06-07 and a budget of £0.00. This method of updating can reduce the number of conflicts that could result in data loss, but it can't avoid data loss if competing changes are made to the same property of an entity. Whether the Entity Framework works this way depends on how you implement your update code. It's often not practical in a web application, because it can require that you maintain large amounts of state in order to keep track of all original property values for an entity as well as new values. Maintaining large amounts of state can affect application performance because it either requires server resources or must be included in the web page itself (for example, in hidden fields) or in a cookie. You can let Jane's change overwrite John's change. The next time someone browses the English department, they'll see 2014-06-07 and the restored £350,000.00 value. This is called a Client Wins or Last in Wins scenario. (All values from the client take precedence over what's in the data store.) As noted in the introduction to this section, if you don't do any coding for concurrency handling, this will happen automatically. You can prevent Jane's change from being updated in the database. Typically, you would display an error message, show her the current state of the data, and allow her to reapply her changes if she still wants to make them. This is called a Store Wins scenario. (The data-store values take precedence over the values submitted by the client.) You'll implement the Store Wins scenario in this tutorial. This method ensures that no changes are overwritten without a user being alerted to what's happening. In the database table, include a tracking column that can be used to determine when a row has been changed. You can then configure the Entity Framework to include that column in the Where clause of SQLUpdate or Delete commands. The data type of the tracking column is typically rowversion. The rowversion value is a sequential number that's incremented each time the row is updated. In an Update or Delete command, the Where clause includes the original value of the tracking column (the original row version) . If the row being updated has been changed by another user, the value in the rowversion column is different than the original value, so the Update or Delete statement can't find the row to update because of the Where clause. When the Entity Framework finds that no rows have been updated by the Update or Delete command (that is, when the number of affected rows is zero), it interprets that as a concurrency conflict. Configure the Entity Framework to include the original values of every column in the table in the Where clause of Update and Delete commands. As in the first option, if anything in the row has changed since the row was first read, the Where clause won't return a row to update, which the Entity Framework interprets as a concurrency conflict. For database tables that have many columns, this approach can result in very large Where clauses, and can require that you maintain large amounts of state. As noted earlier, maintaining large amounts of state can affect application performance. Therefore this approach is generally not recommended, and it isn't the method used in this tutorial. If you do want to implement this approach to concurrency, you have to mark all non-primary-key properties in the entity you want to track concurrency for by adding the ConcurrencyCheck attribute to them. That change enables the Entity Framework to include all columns in the SQL Where clause of Update statements. 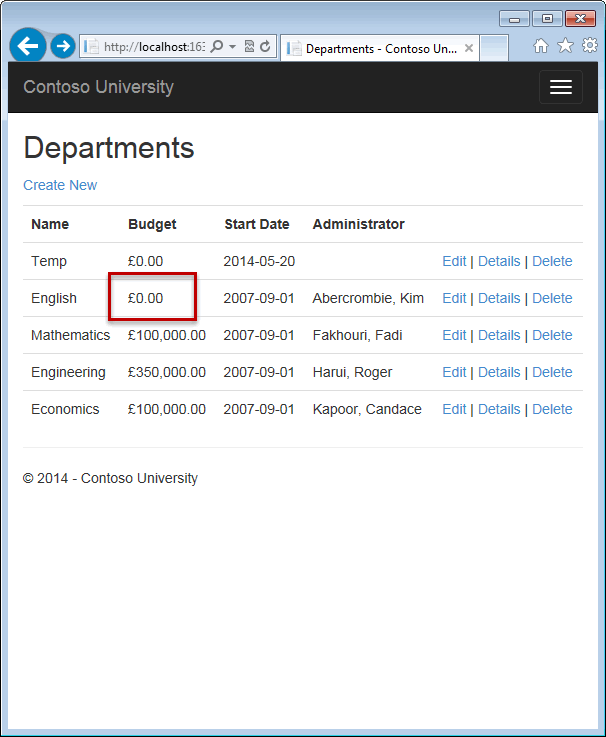 In the remainder of this tutorial you'll add a rowversion tracking property to the Department entity, create a controller and views, and test to verify that everything works correctly. Public Property InstructorID As Integer? 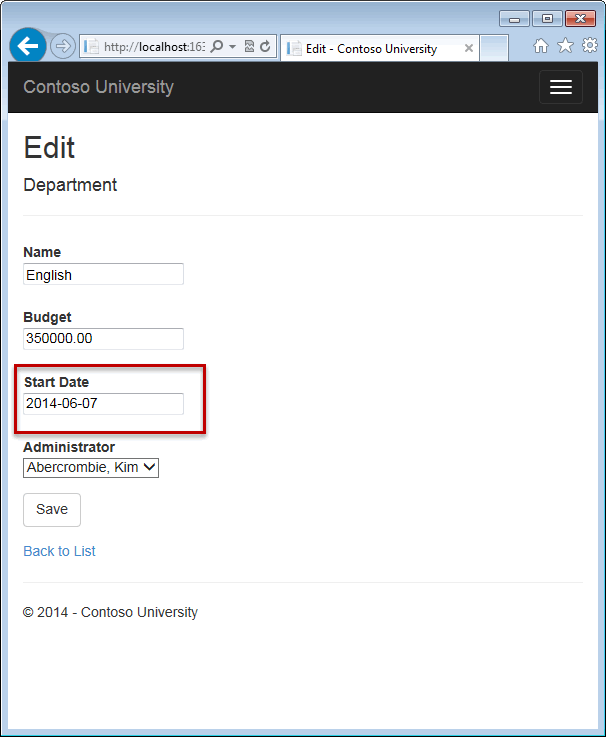 The Timestamp attribute specifies that this column will be included in the Where clause of Update and Delete commands sent to the database. The attribute is called Timestamp because previous versions of SQL Server used a SQL timestamp data type before the SQL rowversion replaced it. The .Net type for rowversion is a byte array. In the DepartmentController.vb file, change all four occurrences of "LastName" to "FullName" so that the department administrator drop-down lists will contain the full name of the instructor rather than just the last name. The view will store the original RowVersion value in a hidden field. 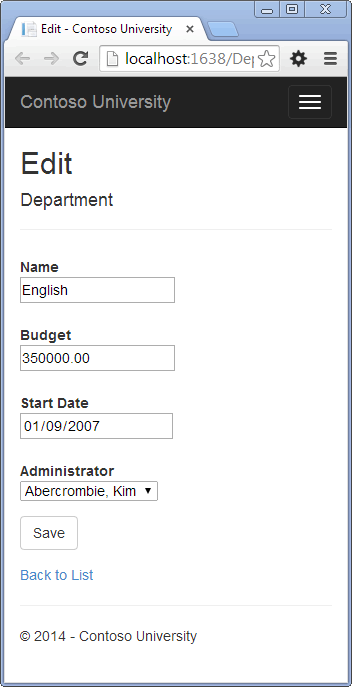 When the model binder creates the department instance, that object will have the original RowVersion property value and the new values for the other properties, as entered by the user on the Edit page. Then when the Entity Framework creates a SQL UPDATE command, that command will include a WHERE clause that looks for a row that has the original RowVersion value. If no rows are affected by the UPDATE command (no rows have the original RowVersion value), the Entity Framework throws a DbUpdateConcurrencyException exception, and the code in the catch block gets the affected Department entity from the exception object. This object has the new values entered by the user in its Entity property, and you can get the values read from the database by calling the GetDatabaseValues method. The GetDatabaseValues method returns Nothing if someone has deleted the row from the database; otherwise, you have to cast the object returned to the Department class in order to access the Department properties. 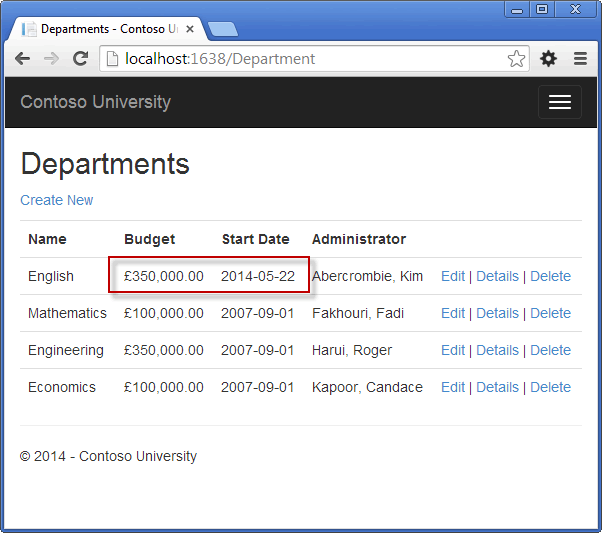 Finally, the code sets the RowVersion value of the Department object to the new value retrieved from the database. This new RowVersion value will be stored in the hidden field when the Edit page is redisplayed, and the next time the user clicks Save, only concurrency errors that happen since the redisplay of the Edit page will be caught. Right click the Edit hyperlink for the English department and select Open in new tab, then click the Edit hyperlink for the English department. The two tabs display the same information. Change a field in the first browser tab and click Save. The browser shows the Index page with the changed value. Change a field in the second browser tab and click Save. Click Save again. The value you entered in the second browser tab is saved along with the original value of the data you changed in the first browser. You see the saved values when the Index page appears. For the Delete page, the Entity Framework detects concurrency conflicts caused by someone else editing the department in a similar manner. When the HttpGet Delete method displays the confirmation view, the view includes the original RowVersion value in a hidden field. 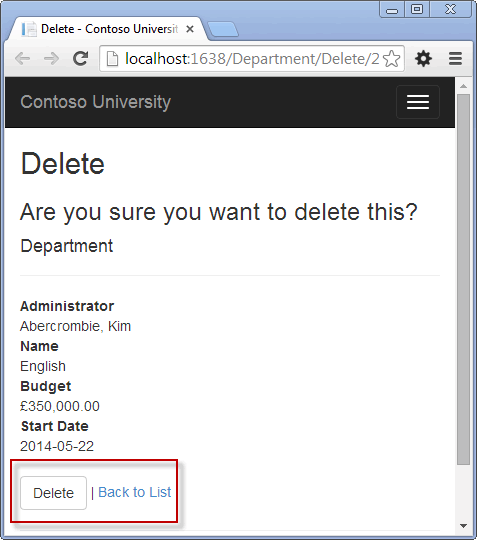 That value is then available to the HttpPost Delete method that's called when the user confirms the deletion. When the Entity Framework creates the SQL DELETE command, it includes a WHERE clause with the original RowVersion value. If the command results in zero rows affected (meaning the row was changed after the Delete confirmation page was displayed), a concurrency exception is thrown, and the HttpGet Delete method is called with an error flag set to true in order to redisplay the confirmation page with an error message. It's also possible that zero rows were affected because the row was deleted by another user, so in that case a different error message is displayed. "Click the Back to List hyperlink." The method accepts an optional parameter that indicates whether the page is being redisplayed after a concurrency error. If this flag is true, an error message is sent to the view using a ViewBag property. 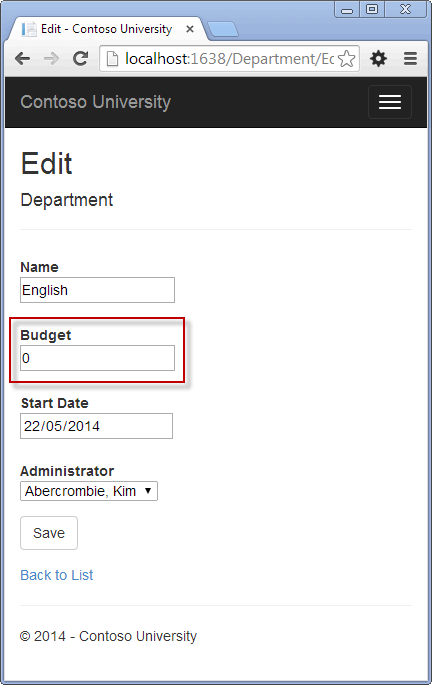 You've changed this parameter to a Department entity instance created by the model binder. This gives you access to the RowVersion property value in addition to the record key. You have also changed the action method name from DeleteConfirmed to Delete. The scaffolded code named the HttpPost Delete method DeleteConfirmed to give the HttpPost method a unique signature. ( The CLR requires overloaded methods to have different method parameters.) Now that the signatures are unique, you can stick with the MVC convention and use the same name for the HttpPost and HttpGet delete methods. If a concurrency error is caught, the code redisplays the Delete confirmation page and provides a flag that indicates it should display a concurrency error message. In Views\Department\Delete.vbhtml, replace the scaffolded code with the following code that adds an error message field and hidden fields for the DepartmentID and RowVersion properties. The changes are highlighted. Run the Departments Index page. Right click the Delete hyperlink for the English department and select Open in new tab, then in the first tab click the Edit hyperlink for the English department. The Index page confirms the change. In the second tab, click Delete. 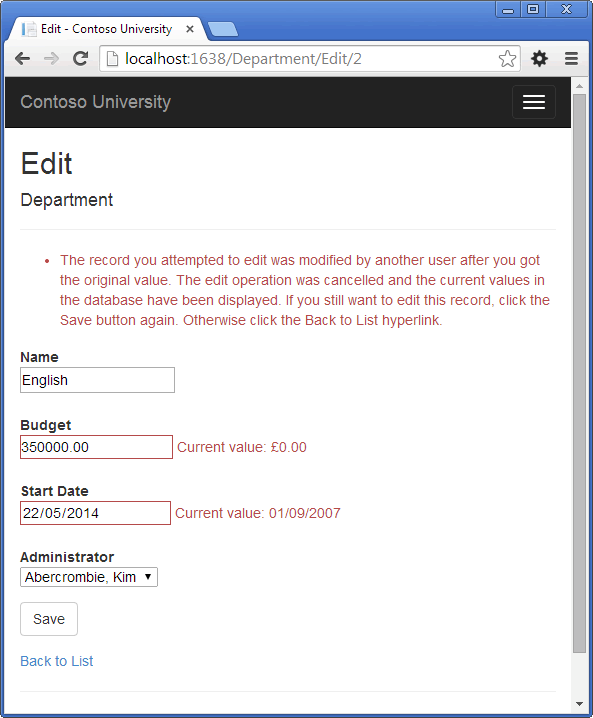 You see the concurrency error message, and the Department values are refreshed with what's currently in the database. 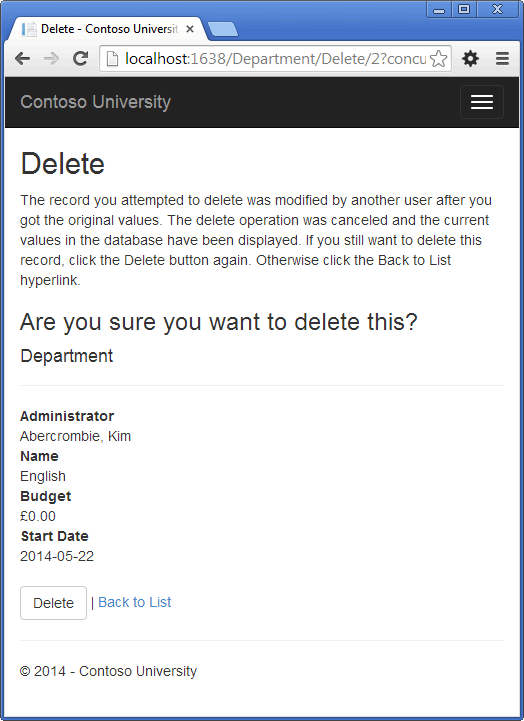 If you click Delete again, you're redirected to the Index page, which shows that the department has been deleted. This completes the introduction to handling concurrency conflicts. For information about other ways to handle various concurrency scenarios, see Optimistic Concurrency Patterns and Working with Property Values on MSDN. 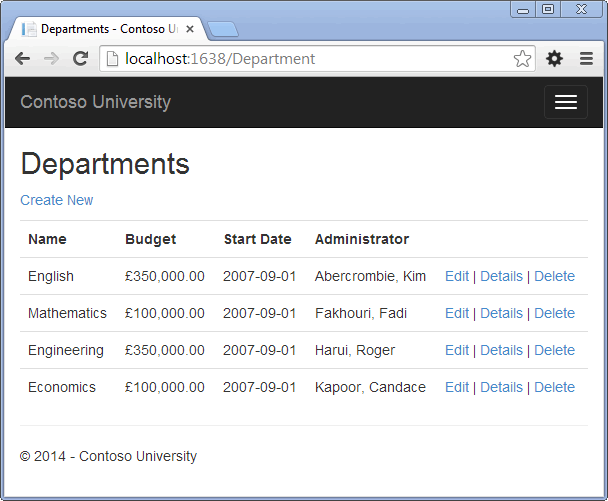 The next tutorial shows how to implement table-per-hierarchy inheritance for the Instructor and Student entities.